In the “old” days Winutilities used to be a GREAT program – today called application. So I jumped into it immediately. First task asked – find duplicates. Yes, it finds them quite fast. BUT, when the results were shown, the first thing I did, absolutelly obvious, was to click on the title of de size colums, so all the findings would appear in SIZE order – from biggest to smallest or vice-versa. And what happened? NOTHING!!!!! So please, developers, tell now what to do? Shall I go thru more than 14.000 files one by one to find the ones that are really important, and that make any difference? Shall I loose MANY and MANY hours to choose and delete thousands of 50 kb files, instead of one bigger 50 Mb one? Common guys – ridiculous!! Did YL fired all previous programmers and kept only interns??? Because only a programmer without any clue of real world would not allow sorting by size on a duplicates files report! This has established itself as a wide-ranging and competent set of tools for Windows. It’s great that they make it available as a promo periodically. I tend to use the Startup cleaner more than most of the other tools, but am glad they are there as well. Many of the tools have individual free utilities that are comparable, but it’s nice to have this set all under one roof. It is practically a lock that you will find something here that will help you out of a tough spot, sooner or later. Any Win users who are at least minimally adept technically should also have the NirSoft suite and the SysInternals suite — both of which are free. (Also Ccleaner, and a couple other standalones.) Then you will be better prepared for the Ins & Outs of Windows. If you find these too difficult to use, maybe you should consider defecting to Apple . . . ? Excellent program. Have been using for years. Cleans computer without any problems. Keeping your system clean and in the best condition, one needs to take care of it on regular basis. It is a difficult task to keep up with manually so one needs to take the help of a software application. WinUtilities Pro is one of the best software of it’s kind, it is designed to help users clean-up and optimize their PC with the basic aim of keeping the PC running smoothly. The download size is small ~6MB and the installation process is straightforward and simple. The applications UI looks great and every feature is neatly organized. Each feature opens up in a new window and scans the drives or errors to fix them on users choice. Along with basic clean and repair tools, WinUtilities contains tools that help optimize the performance of the PC. Privacy and security, task scheduling and registry fixes are a few to name. It is like the most useful feature of the whole package. It contains a lot of options that can be helpful for PC performance like deleting junk and emptying recycle bin, removing windows and internet temporary files, and cleaning history and saved form data of browsers. The UI is clean and intuitive, offering all the features upfront and ready to use. This makes the tool easy to understand and use by almost all types of users even novices. The modules tab contains all the six categories of tools namely Clean Up and repair, Optimize and improve, Privacy and security, File and folder, registry tools, and system tools. All these tools are designed to fix and optimize the PC and keep it running at maximum performance. An option to scan the system would be great as it can tell the users what is wrong with their PC, it is difficult to check you PC by each tool separately. Tools like file shredder, registry cleaner and defrag, and disk cleaner and defrag are pretty simple and useful tools that give boos to your PC performance. The UI of this application has premium looks and feels, its layout is great and tools and features are arranged in such a manner that it makes the whole task easier for all types of users. 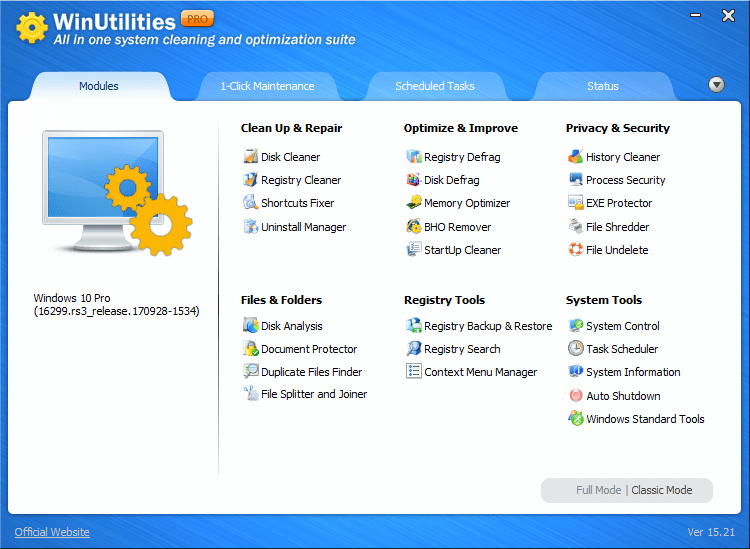 WinUtilities Pro is one of the best optimizing tool that helps users clean up their PC. It has a great and huge set of tools that can be useful in many different situations. The ease of use makes it suitable to all kinds of users from novices to experts. Even though it lacks system scanning, it’s still worth trying out. One of the best in this field . An old standby. Quality product, if not state-of-the-art, but it does the job. Good Back-up and second opinion.. Great lifetime gift. Thanks WU.. SOS Rocks..!! Very good. It’s easy to use. WinUtilities Pro has a solid and premium look and feel that is in itself reassuring. I always find a neat uncluttered user interface attractive no matter how much software I install and run. WinUtilities for one won the user interface appeal contest hands down. But was there more to it than just the looks? WinUtilities is a complete suite armed with a registry tool, PC optimizer, file manager and a plethora of system tools that all work together to make your system a lot faster. Even though the optimizations and tweaks aren’t out of this world, It manages to make regular tasks like registry cleanup and disk/registry fragmentation simple enough to a regular computer user. The WinUtilities Pro learning curve is forgiving. Anyone could launch this app and optimize his or her PC within minutes thanks to the uncluttered user interface that puts all the important tools in plain sight. All the optimization happens at the modules tab. Here, you will find a huge range of tools that will help you fine tune different elements of your PC. With WinUtilities, you get to do more than just defrag and delete useless files. WinUtilities will constantly run in the background taking strict control over processes and RAM consumption. Don’t get me wrong. You’ll still need an antivirus even when running WinUtilities. But you will definitely find the process security, .exe protector useful. The additional file delete and file shredder tools will ensure that you keep a tight hold over all the data you want erased. I really don’t know what WinUtilities Pro’s idea was when coming up with the Scheduled Tasks tab but I expected more scheduling than the mere disk, history, defrag and registry cleaner options they gave me. Why not let me schedule other optimization tweaks like history and recycle bin emptying? Every function, from the feature-rich module tab to the automated 1-click maintenance tab makes regular PC keeping simple and less redundant. WinUtilities is a neat tool that will do what you want it without breaking down on you. It is the perfect tool to any PC owner who doesn’t want to spend hours meddling with native Windows settings to maintain performance. The product website has very limited information. I wanted to find out abouconceptualclarity@maxxsouth.nett the process security and .exe protector, but it was useless. best Utilities.not slow your pc.better pc ever. Very complete and comprehensive set of Win maintenance apps.